Canada’s agenda-setting newspaper The Globe & Mail yesterday memorialized Rachel Carson’s book Silent Spring (Houghton Mifflin, 1962) as one of the world’s 50 greatest reads, praising its role in stimulating greater public understanding about science and helping to shape the modern environmental movement. I’ve been thinking a lot about the book lately, with 2 graduate students working on issues relating to environmental communication and one having just completed such a study. I read the book for the first and only time in a social and environmental studies course in high school. So it was more than a little serendipitous that within minutes of reading the review, a Google Alert came thundering through the ether to publicize two new reports: the first is the 2008 Corporate Social Responsibility Index, released by the Center for Corporate Citizenship and Reputation Institute at Boston College. Using data collected for Reputation Institute’s 2008 Global Pulse Study, the report evaluates the top 50 U.S. corporations in terms of their commitments to sustainable economic growth and finds that corporate governance, ethics and transparency are increasing in their importance to overall corporate reputation. An important caveat is that the data were gathered long before the market meltdown; as some analysts have argued, the downturn in the economy will be a true test of corporate commitments to sustainable business practice. The second report called MapChange was released by the Vancouver-based green marketing and brand management firm Change (the full report can be downloaded here). 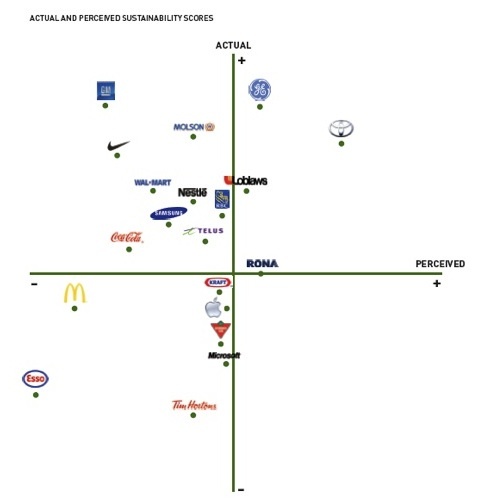 MapChange is a “perceptual mapping tool” that assesses how committed the top brands in Canada are to the environment, and how committed consumers think they are. In short, it allows brand managers to assess a range of possible reputational threats, whether these derive from specific stakeholder concerns, such as when activists demand that global corporations change their supply chain practices to limit carbon emissions, or expectation gaps, such as when companies fail to communicate progressive environmental practices to stakeholders, thus falling short of consumer expectations. As the consultants at Change make clear, in the world of branding reality is a social construction: “what is real is only what is perceived to be real.” Communication is thus central not only to effective marketing but also activist criticism of brand performance. Indeed, the report indicates that better action doesn’t necessarily equal better perception. General Motors has been regularly criticized for its sustainability efforts, but despite performing better in Actual Sustainability practices than its competitor Toyota, the latter has attained by far the highest Perceived Sustainability score (must be all those Prius product placements on hit cable shows like Six Feet Under and Weeds). The report also shows that some brands have benefitted from a “halo effect” — consumers of Apple products perceive the company’s sustainability practices to be much better (5th overall) than their actual performance (14th overall) — while others, such as Nike, have not been able to overcome the bad public images they accrued from past behaviour, despite progressive efforts to improve business practice (Nike ranked 17th on Perceived Sustainability, despite being 5th on Actual Sustainability). It’s unclear what the future holds for sustainable business practices. The Wall Street Journal reports that on the heels of the market meltdown in the U.S., oil prices have plummeted because of fears about a global recession, a move unlikely to stimulate reductions in consumer demand for fossil fuels and thus the pressure needed to keep corporations focused on the triple bottom line. In a recent column in The New York Times, Thomas Friedman writes that we should invest all bailout profits in green infrastructure to stimulate sustainable technology. Yet, if we believe the Financial Times, the economic crisis has made consumers worldwide less likely to spend their money on green products. All of these mixed signals mean many things, not the least of which is that if you are in the business of green marketing, there is going to be a lot of confused corporations looking for strategic counsel and a lot of environmental activists with their radars intently focused.